Aaron Burr’s sensational 1807 treason trial makes for good history packed with scandal, courtroom fireworks, and great men behaving badly. Historians wonder what drove the former vice president to self-destruct. Wheelan (Jefferson’s War, 2003) blames the hostile Chief Executive and makes a reasonable case. Thomas Jefferson picked Burr as running mate in 1800 because he needed to carry New York. A Revolutionary War hero and brilliant lawyer, Burr was a rising, ambitious politician. His positions on slavery and women’s rights were far ahead of his time. He delivered New York, but the election ended in a tie between Burr and Jefferson; in 1800, electors cast two votes but didn’t specify which was for president. The election was thrown into the House of Representatives, dominated by the losing Federalists, whom Burr hoped would prefer him to Jefferson. Yet Wheelan points out that Burr refused overtures from Federalists, while Jefferson made promises that gained their votes. Jefferson then set out to destroy his rival. He denied Burr’s supporters patronage, weakening the vice president’s power base, and chose another running mate in 1804. Trying to recoup, Burr ran for New York governor, but Jefferson worked to ensure his defeat. Popular histories claim Burr’s 1804 duel with Hamilton wrecked his career; Wheelan insists he was ruined before he killed Hamilton. Burr wrote the British government, offering to lead a revolt in the restive states beyond the Appalachians. Getting no response, he eventually organized an expedition that sailed down the Mississippi until Jefferson’s arrest order caught up with him. During the trial, Jefferson peppered the prosecution with advice, some of it illegal and all of it unethical. Unfortunately for Jefferson, Chief Justice John Marshall, a bitter enemy, presided. 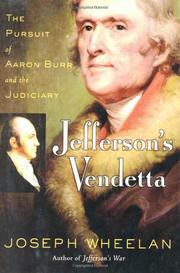 Marshall’s rulings favored Burr, who was acquitted. Entertaining and well researched, but less controversial than the publisher’s claims. Wheelan is only one of the recent historians (e.g., Joyce Appleby and John Patrick Diggins) who have begun to separate Jefferson the immortal founding father from Jefferson the man, fiercely ambitious, convinced of his righteousness, and unforgiving of anyone he considered a threat.